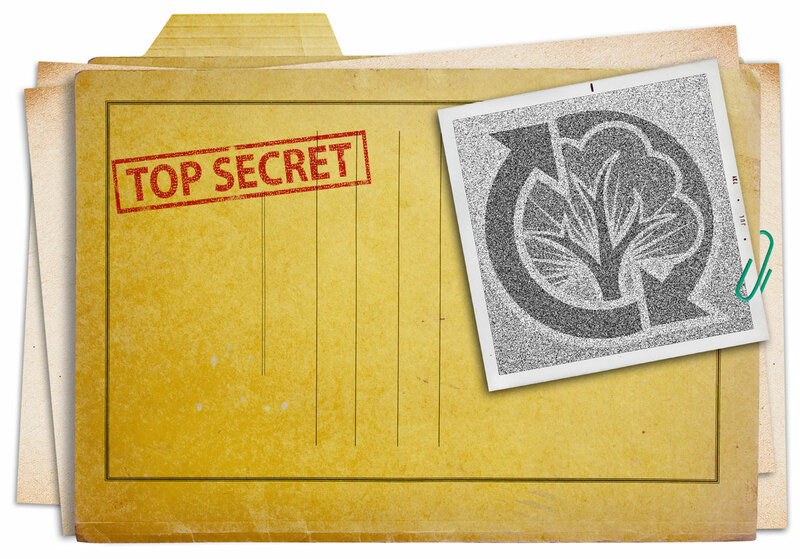 I’ve managed to climb out of the RootsMagic underground labs for a quick break and was able to sneak some top-secret documents past the watchful gaze of the RootsMagician. I’m excited to give you an exclusive look at some long-awaited new features coming to RootsMagic 7. (Keep in mind that these features are still under development and may change before they are officially released). So here’s your first look at two of these new integrations with Ancestry. 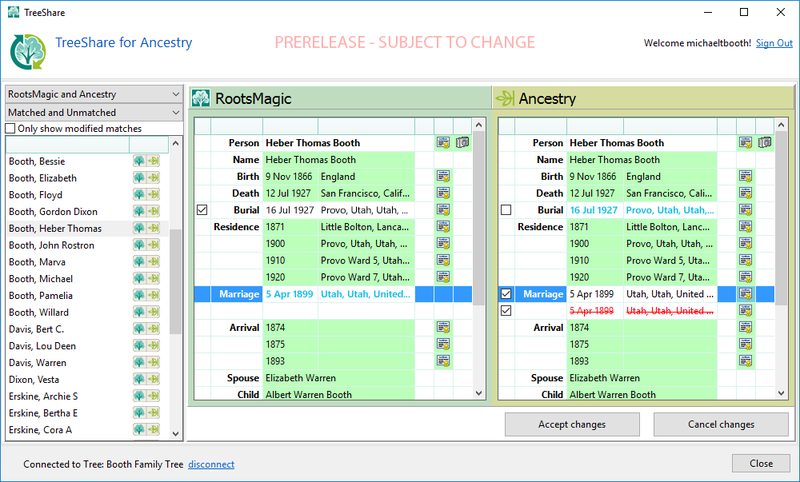 Our upcoming TreeShare for Ancestry allows you to connect your RootsMagic data with an Ancestry Member Tree. Once connected, you can quickly find differences and share data between the two trees. Click on “Ancestry,” and you’ll see a list of matching records from Ancestry’s many collections. This is familiar territory for those who have already used our WebHints. But this is where the similarities to the other record providers end. 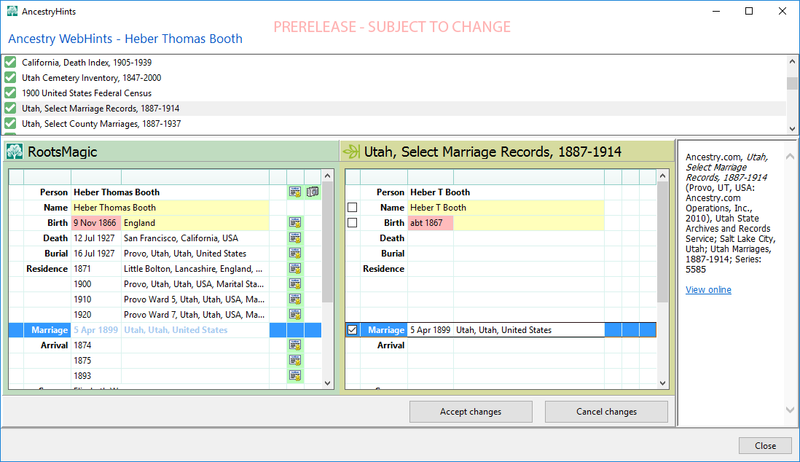 Instead of just viewing the records, you can click on information contained in the Ancestry record and copy it into your own RootsMagic file. It can even incorporate images and source citations! Currently, these features are being put through their paces by a group of testers. As the features become more polished and stable, we expand the group of testers and repeat the process. If you’re interested in becoming a tester and get early access to these features, you can sign up at here. Well, it looks like my break is about over and it’s time for me to return to the underground labs. Hopefully, you’ve enjoyed this quick glimpse at these exciting new features coming to RootsMagic 7. Don’t forget to sign up to be a tester and- uh- please don’t tell the RootsMagician where you heard about all this. Very impressive! I can hardly wait. I hope I will be able to logically merge my Rootsmagic file contents with my Ancestry tree contents. I have some research results in one and other research results in the other. Do I have to merge my two files? I use ancestry for my possibilities, but my Roots magic for my confirmed matches. And can I I corporate Ancestry sources without combining my trees? Thank you for sharing this info! I greatly anticipate getting these new features for RootsMagic 7! Do you have to be a member of Ancestry to access the hints? Looks great! Waiting not so patiently for the release. This is a great sneak peak at what’s to come. I’m ready! I’ve signed up to be a tester but haven’t gotten the call. I’ve wanted this for a long time as a means to also coordinate family members working together. I’ll keep watching. I wish to thank you so very much for letting have a peek into the works! It is looking great, I can not wait to be able to get the two programs I use the most … separately … to be able to have them work with each other, together!!! The best merge/sync ever heard of! Thank you so much Michael. Pleased to see the connection with Ancestry coming about. Any news about the Rootsmagic to go & CD share for mac users. Concerning my post above – I learned I can merge two Rootsmagic files by opening side by side and drag/drop. I guess that’s the answer and not too bad a one. how’s it going with the ancestry connection? I’m working 4 separate trees and am looking forward to syncing them up. That is awesome! I am anxious to try it all out! These are the features that I was hoping for. Being able to create new DB and compare differences before actually starting the RootMagic Ancestry SYNC. I am going to sign up for early tester, My database is small to medium (Less than 3000) I have used Ancestry and Family Search for a few years. I came to RootsMagic from Family Tree maker. I will pass my Genealogy Tree down to the next generation from RootsMagic. Thanks for the preview. The feedback is appreciated and only slightly gives me more patience to wait for your update! Looks good. I am excited to see these new releases appear for us general users and somewhat beginners in the world of Genealogical Research. They look to be good, common sense features. Well done. Enough of the teasing – let’s get on with the show! I purposely switched to RM full time for my main proven tree when they said FTM was going away. It looks great, but I do hope that the dates will be put in order no matter what it is as shown in the tree share window. The Residence dates are in order but then when the Marriage and arrival dates are shown they are out of order with the Resicence dates. I hope that the ancestry info includes the prefix as it is in the RootsMagic. We’d have a great genealogy program as shown here. I definitely intend to use both programs. Thanks for the update!! Liking away the new feature looks so far. I definitely want to be a tester. I have a small tree of about 4000 people, but Ancestry is the primary site that I use. I’d love to be able to give input on this new exciting addition to RM. Bring it all on, Bruce!! Look forward to your amazing new ideas. Can testers be MAC users? I’m excited, I’ve been waiting for this for a long time, I am always downloading images and files from ancestry.com into my RootsMagic, so if there might be a quicker or easier way of doing it, I can’t wait. I love RootsMagic, I have been a user since before RM1. A marriage town, but no church place, we can just drag and drop from the Ancestry data base line into the Roots Magic data base line. If this is so, I wish it was possible to do this with Family Search. A great job – well done. It looks great!! I can hardly wait. Exciting news …. I have 4 ancestry trees that I need to sync to my RM tree and with each other. Looking forward to the new features. Should I be a tester? I started with Family Origins 2 or 3 and you continually break new ground. Genealogy magazines always rates Roots Magic as a top program. I never understood why so many people buy another program. This is very exciting. I love that you keep growing the features in RootsMagic! You’re the best! THis will elevate RootsMagic from just being a bloody good system to being the best around. When do you expect to have the full version for sale? I’m holding off buying this until then. when we sync our rm pc file with a ancestry tree of our own, will our photos and attachments snyc up to ancestry too? Just wondered since otherwise to add a photo you have to add each one individually to the ancestry tree, takes too long after investing all the time to already attach to my pc tree. Yes. Photos and attachments (as well as source citations) will go in both directions. When the testing is complete and we’re satisfied that it is ready for general release. So, will this be an automatic upgrade or will it be necessary to purchase a newer version of RootsMagic? Will these new advantages be automatic? Reply: This will be a free update to RootsMagic 7. I sure hope we will be able to keep ancestry.com turned off. Great! I have a love hate relationship with Ancestry.com. Think I will be downloading my tree(s). I don’t want the living and recently departed to be on the web. Hoping if I upload, I can filter out those people like when I create a gedcom with RM. Can’t wait! I signed up to be a tester at Roots Tech. Can’t wait. FTM (new) is so screwed up right now you can only download unsynch’d GEDCOM trees. All but one small tree of mine is now ‘detached’. We need Roots Magic sync to work!! Thanks for taking the time. I volunteered to help test, too. I love the feature of bringing the photo documentation and citations into my RootsMagic program. 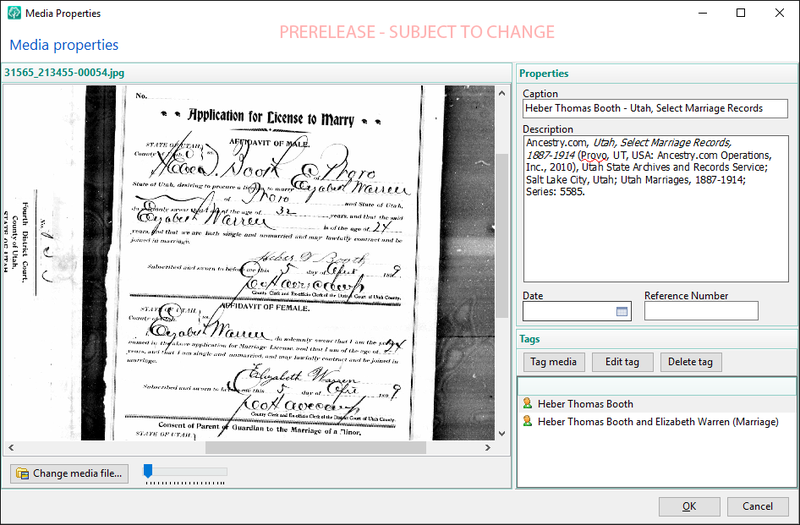 Another plus will be the ability to compare files from Ancestry with mine…side by side! Thanks so much for working on this. I ALWAYS recommend RootsMagic to anyone starting their family tree. I am looking forward to your proposed changes that will improve everyone’s ability to improve their record gathering and records. I think it will be good. I use more than one site to find information. Are you only using users with large databases as testers? I signed up early on but have separated out my different lines into different databases so all of them are relatively small. 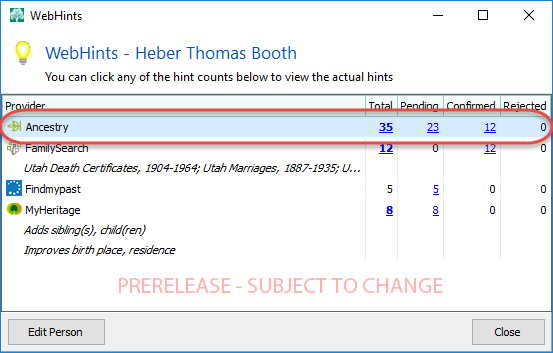 The facility to download the data from Ancestry makes this a fantastic upgrade – The current webhints is frustrating because there is no way to directly utilise the information it reveals and it often duplicates data sources already in my record wasting time. Reply: We need testers with all sizes of databases. This is great. I just got the latest update to FTM (2014.1) And not Roots Magic wont recognize FTM files. Cant wait to go directly to Ancestry Trees. 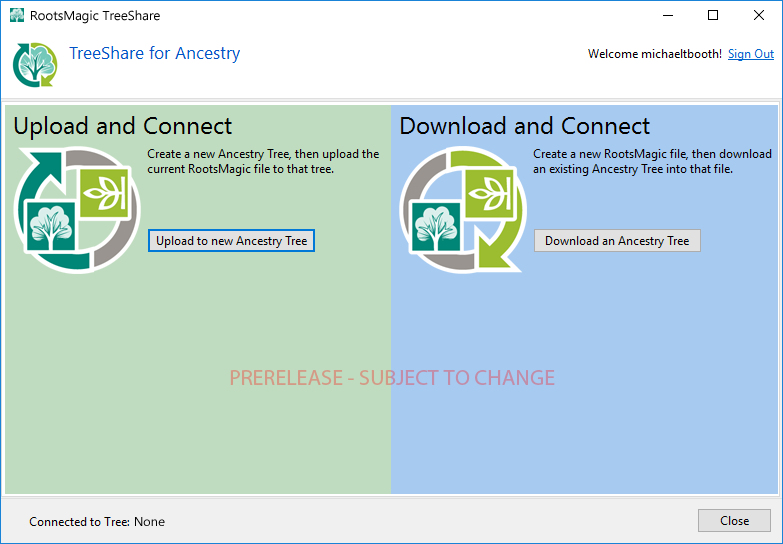 Reply: RootsMagic’s partnership will Ancestry allowed us to direct import all versions of Family Tree Maker (FTM) up to version 2014. Family Tree Maker 2014.1 is now owned by Software MacKiev. RootsMagic is no longer able to direct import Family Tree Maker 2014.1 (22.0.1.1501) or later versions due to file changes. You can read more about it on this Knowledge Base article. Checking Find my Past and Heritage, we have to pay to see, will this also be with Ancestry? Reply: A subscription to Ancestry is not included in the purchase of RootsMagic. As best I understand it, I think it looks to be great. Thank you! I saw this demonstrated at the Demo Booth at Roots Tech. Can hardly wait for it! Very interesting but Ancestry is still fired. When can I finally sync my Ancestry Tree with my RootsMagic Tree? Reply: When it is stable and ready for release.